A Proof set is a collection of Proof coins from one particular year. The set can be officially marketed by the issuing mint as a "set" or can be individually assembled by a dealer or collector from Proof coins purchased separately. The coins contained in a Proof set are special specimen strikings for presentation, souvenir, exhibition or other numismatic purposes. The term Proof refers to a special method of manufacture that brings out the finest detail of the coin's design and results in the highest quality coins available. The earliest known United States Proof coins are dated 1801. However, it is believed that these coins were struck in later years using dies with the 1801 date. Before 1856, Proof coins were only made by special request. Therefore, they are very rare and expensive. Originally, Proof coins were struck to make sure the quality of the dies and the set up of the coining press was proper. The coin press operator would then show these coins to the Chief Coiner to prove the quality of his work. He usually struck the coins several times to make sure the detail in the design apparent. These coins were usually then stored in the United States Mint Coin Cabinet for archival purposes. Over the years, the Proof coin process developed into an additional source of revenue for the United States Mint. Proof coins minted from 1856 until 1936 have a brilliant mirror-like field with contrasting frosted devices. During this time Proof mintages ranged from approximately twenty coins to a few hundred. these coins are very rare and expensive in today's coin market. From 1908 until 1916, and a few 1921 and 1922 silver dollars, the United States Mint produced Matte Proof coins. These coins have a granular or sandblasted surface instead of the mirror fields with frosted devices. In 1998 the mint produced a special silver Kennedy half dollar with the Matte Proof finish. Currently, Proof coins are made at the Philadelphia, San Francisco or West Point mint facilities. However, the Denver mint facility did produce one proof coin, a ten-dollar gold eagle in 1984 for the Los Angeles XXII Olympiad - Olympic Torch commemorative coin. Using modern high-tech equipment and processes all Proof coins now have mirrored surfaces contrasting with frosted designs (also known as cameo). Beginning in 1861, The United States Mint began selling sets of several Proof coins directly to collectors. These were not comprehensive sets of every coin minted, but subsets of the current coinage. For example, you could buy a set of just the minor coinage (for example one cent, two cent, three cent, and half dime coins) or silver coinage or all the gold coins. This practice ended in 1901. Beginning in 1936 the mint started issuing complete sets of all circulating coins in the Proof finish. The striking of Proof coins was temporarily suspended from 1943 through 1949 due to the efforts of World War II. Production was again suspended in 1965 through 1967 due to a coin shortage in the United States. Sets from 1936 through 1972 included the penny, nickel, dime, quarter and half dollar. From 1973 through 1981 and again beginning in 2000, the dollar coin was also included. Special Prestige Proof Sets were sold from 1983 through 1997. Beginning in 1999 the sets also contained each of the Fifty State Quarters or National Park Quarters. Beginning in 2007 the four Presidential dollars were added. Modern Proof coins are known for their highly mirrored fields and deeply frosted devices. However, that was not always the case. From 1936 until approximately 1972, only the first few coins made from a fresh set of dies had the cameo contrast of the deep mirrored fields and frosted devices. New technology introduced in the early 1970s enabled the United States Mint to produce all Proof coins with the distinctive cameo contrast. You can purchase current US Proof Sets directly from The United States Mint. 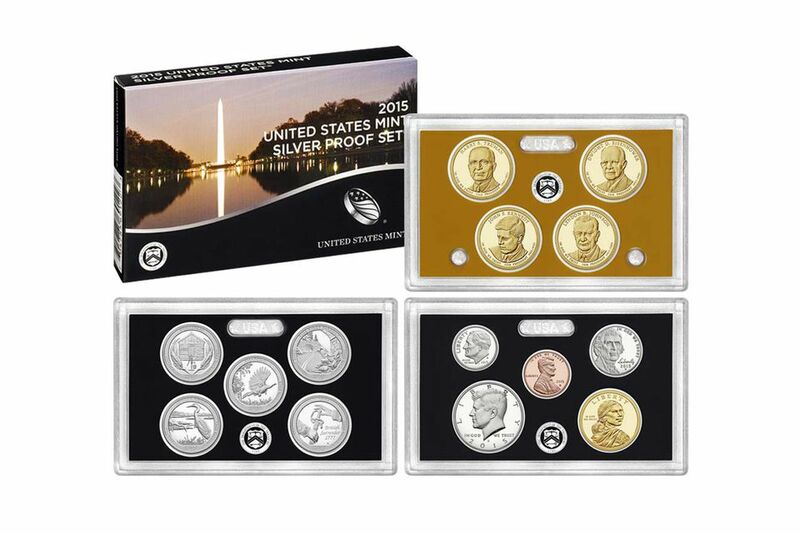 Previously issued Proof sets can be bought and sold at just about any local coin dealer or online. A 1936 U.S. Proof Set contains each of the five coins made by the United States Mint in a special Proof finish and sells for several thousand dollars.